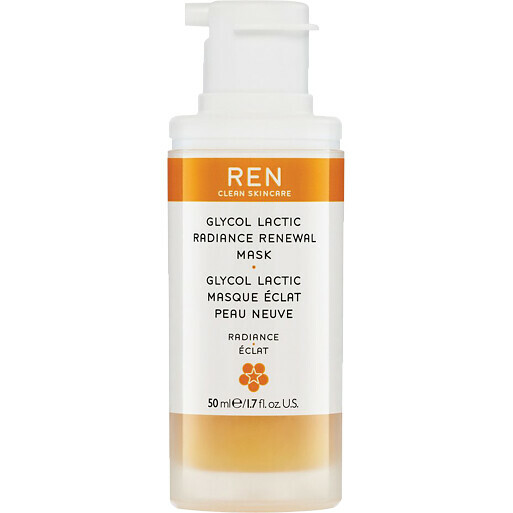 Reveal a brighter, healthier-looking complexion with the REN Glycol Lactic Radiance Renewal Mask, a weekly treatment that dramatically improves skin tone. Created to remove dead skin cells and renew skin in a flash, this highly effective mask helps to reduce skin congestion and blemishes whilst smoothing fine lines. The citrus-scented gel is suitable for all skin types, but is not recommended for those who are particularly sensitive or reactive. At the heart of the Glycol Lactic Radiance Renewal Mask is a quartet of powerful fruit acids, including glycolic acid from pineapple, lactic acid from passion fruit, citrus acid from lemon and tartaric acid from grape, which exfoliate and encourage cell renewal. Added omegas 3 and 7 from blackcurrant seed oil help to repair skin, ensuring a brighter, more radiant complexion. Apply a generous amount to clean skin, avoiding the eye area. Leave for 10 minutes and wipe off with the included cloth, making sure to dampen it first. A slight tingling may be experienced during application.